There are many reasons why you should never entertain the presence of skunk in your premises. Though others may argue that they are useful due to the fact that they feed on small rodents like rats and mice, their presence around human beings is a great heath concern. 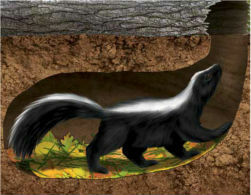 It will interest you to note that skunk is the second leading cause of rabies in Canada. But it is not only rabies that skunk can transmit to human beings. Skunks are also known to have a characteristic pungent smell that many find to be irritating and also don’t forget that they have a defensive spray which can cause a lot of irritation to the skin and temporary blindness should it land on your eyes. Therefore, you should make every effort you get rid of skunks as soon as you see them. One way of knowing if your premises have been infested by skunk is to actually see them. Though this might not be very easy given that they are nocturnal creatures and will only come out when the rest of the world is sleeping. Another way to know that you are facing infestation and seek for the skunk control service providers is if you see furrows in the ground especially in areas around foundations. If you are bothered with skunks, get in touch with us and we will help you with the skunk removal services without any hitches. 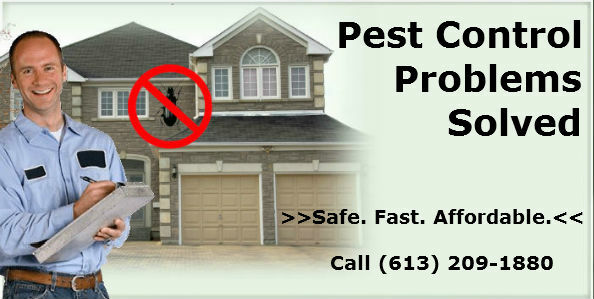 We are experienced in this and other pest control services where we employ humane and non aggressive skunk removal methods. Our desire is not to kill them or hurt them in any way but to make them leave your premises so that they can find alternative dwelling places where they will not bother you. 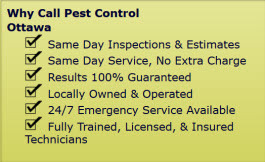 Contact Pest Control Ottawa today about our extremely humane skunk removal services. Our service area includes Ottawa, ON and the surrounding areas. Humane Skunk Removal and Control Services in Ottawa, ON call (613) 209-1880.